Turn the standard sandwich on its head with a French twist. A traditional French open-faced sandwich, the tartine adds everyday elegance to the lunchtime staple. Toasted rye, topped with fresh spinach, creamy mozzarella and lightly roasted tomatoes makes for a new kind of sandwich to excite your taste buds and your lunch box. Preheat oven to 400 degrees Fahrenheit. While the oven warms up, assemble the tartines. 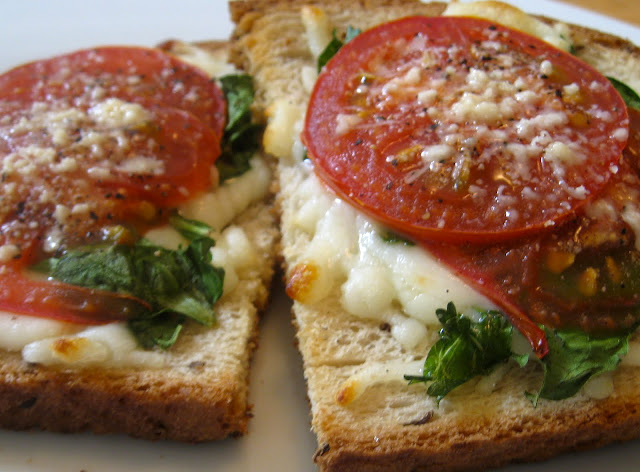 Place the bread on a foil-lined baking sheet and evenly sprinkle the mozzarella on top. Roll the spinach leaves into a cigar and cut into long, thin strips. Place a little of the spinach on each half and top with two tomato slices. Finish the tartines with a light seasoning of salt, pepper, and a sprinkling of parmesan on top. Place the tartines in the oven and cook for 5-10 minutes, until the cheese melts and the bread is lightly toasted.